Welcome to The Regent. 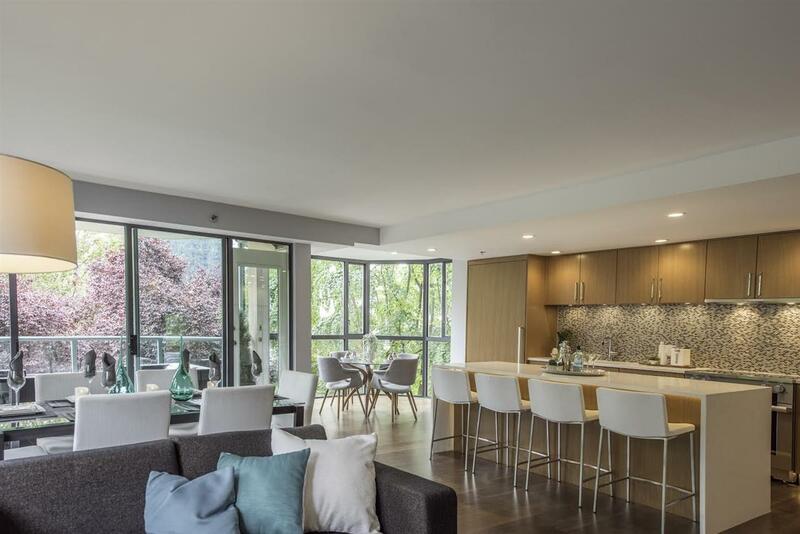 This stunning 2 bedroom residence was spectacularly renovated in 2017 and was a finalist for a Georgie Award (Canadian Home Builders Association) and two Ovation Awards (Great Vancouver Home Builders Association). The amazing transformation created a great room that is an entertainer's dream. Other features include heated floors in great room and both bathrooms, Miele appliances, gas fireplace, large balcony, insuite laundry and gorgeous counter surfaces and tile work throughout. 2 garage parking spots and a storage locker are included. The building is well maintained and conveniently located. Strata plan shows 1212 sqft. Measured at 1239 sqft. Your pets are welcome. Also easy to show by appt.